“Dear Kurma, would it be at all possible for you to send me the recipe for the chickpea dish that you describe so wonderfully in your essay on “The Chickpea That Ate Melbourne”. Drain and rinse the raw soaked chickpeas into a few colanders. Empty the chickpeas into a 200 litre pot, cover with hot water, and bring to the boil. Meanwhile, fill another large pot almost to the top with hot water, and bring it to the boil on another flame. 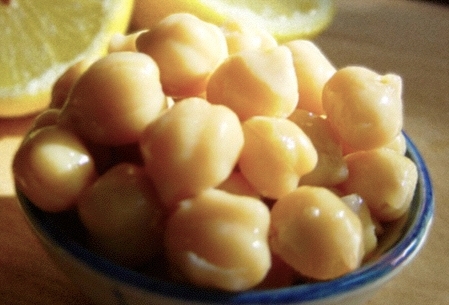 Reduce the heat under the chickpeas to a rolling boil, and cook the chickpeas for about an hour, or until they are butter-soft. Remove the cooked chickpeas with a lifter and transfer them to buckets with lids. Scoop out all the chickpea cooking water into a couple of buckets, and set it aside for later. Leave the empty pot on the stove. After the chickpeas and their cooking water have been removed and set aside, divide the boiling water into the empty chickpea pot. Divide the cut potatoes between the 2 pots, bring them to the boil, and cook them until just done. Be careful not to overcook them. Remove the vegetables from the water with a lifter immediately they are done, and transfer them into 10 litre buckets with lids. Tip the spinach into one of the pots of hot water, and leave them to blanche before removing them with a lifter, and transferring them into 2 x 10 litre buckets. Chop the ginger into smaller chunks, and blend it to a puree in an industrial food processor with a little water. Remove and set aside. Sprinkle in the asafetida, fry momentarily, then add the channa masala, and the coriander powder, stir to mix, then immediately add the ginger puree. 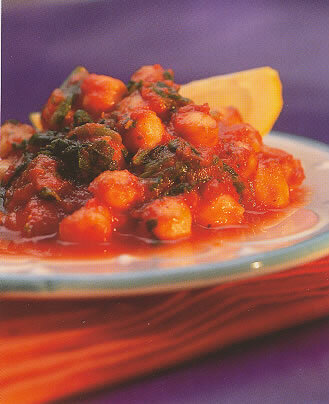 Fry the ginger puree until aromatic, then add 2 litres chickpea cooking water, and bring the seasoning mix to a boil. Add the salt, the sugar, the butter, the tomato paste, and top up the pot to 2 inches from the top with more of the remaining chickpea cooking water. Bring to the boil while stirring often. Layer all the cooked vegetables and chickpeas alternatively with jugs full of the sauce in two 50 litre containers. Mix the vegetables, chickpeas and sauce carefully with a big paddle, avoiding smashing them up. Divide the vegetables and chickpeas into clean containers and cover with tight-fitting lids. Serve to 350 hungry souls.